Wanna Hear Something Scary? EBOLA! When I started this blog a few years ago, I thought of it as a place where I could go to gather my thoughts about art and creativity, subjects which I had little opportunity to contemplate while working in medicine, a world of rapidly evolving technologies and chronic time pressures. I soon discovered that the netherworld between art and science was what really captivated my imagination. The muddy world of politics, with its stubborn antagonism to science, was never even a remote consideration. Ebola has changed that. Epidemiology can be a satisfyingly precise, if somewhat empiric, science. The parameters that lead to the spread of an epidemic can be observed and measured. The effect of interventions on those parameters can be estimated, leading to programs most likely to limit that spread, and ultimately end the epidemic altogether. Science, dispassionately applied, can do that. Reacting to fear and operating on hunches can increase news viewership and sell stuff, but it cannot end an epidemic. Designing an Ebola policy according to the preferences of a poorly informed electorate with a distrust of science would be a recipe for disaster. There will be some rough going in the reading ahead. It will be long. There will be some science, and even a little math. I will talk about law and politics, which are not my areas of expertise, so bear with me. There will not be much art; we have already seen too many pathetic photos out of Africa, which engage our emotions but don’t really teach us much about the virus or what to do about it. 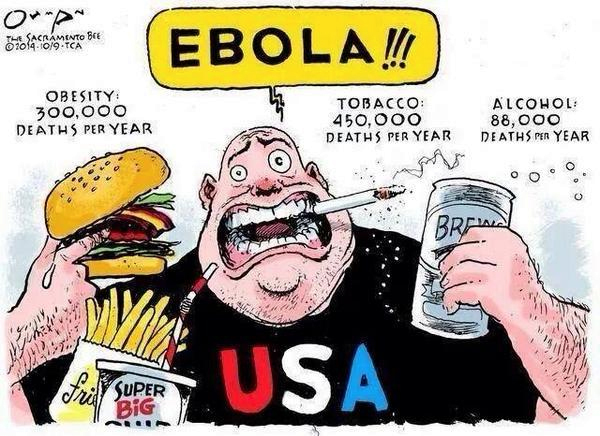 Some of it will be disgusting, but Ebola is certainly that. In the end, I hope you will have a better understanding of how Ebola works, why it likely poses no risk to you personally, and what we as a country must do to continue to keep it out of America. If you are not prepared for a little bit of a trek, however, go find another blog. 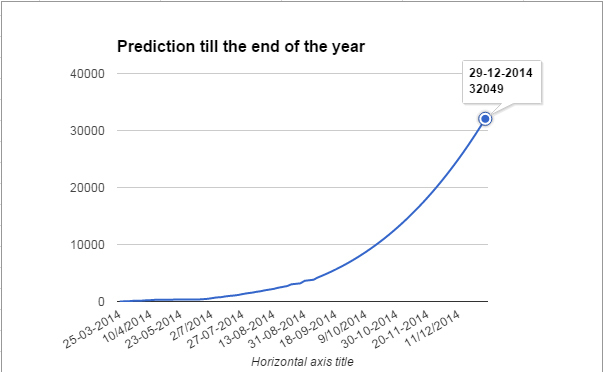 This graph predicts the cumulative number of Ebola cases expected in 2014. For the end of October it predicts about 14,000 cases. The actual number: 13,703. I am impressed with how accurately the scientists at WHO and CDC have predicted how the West African epidemic would evolve, both in extent and over time. (The political failures that followed these spot on predictions is another matter entirely.) Two important parameters have been derived from this outbreak; understanding them, and some basic Ebola biology, can help put the real risks of Ebola at home in perspective. By far the scariest number for Ebola its case fatality rate (CFR)—of the number of people who get Ebola, this is the number who die from it. In the current outbreak in West Africa, that number is about 50%. In previous outbreaks it has ranged from 30% to 90%, but on average, in Africa, roughly half of all of those infected have succumbed. This number is very dependent on the quality of care received those ill with the virus. In the West African hot zone, what sparse medical resources that once existed have been decimated by the epidemic itself. Medical care is minimal, and CFR is high. In the USA the numbers are too small to be statistically significant, but consider the trend. As of this writing there have been eight Ebola cases identified here–Thomas Eric Duncan (the Liberian man who died of Ebola in Dallas), two nurses who cared for him, four medical missionaries, and a television camera man). Of these, only Duncan died, and he was the most far gone when his treatment began. This is one of eight, for a case-fatality rate of 12.5%. Scary? Yes, but way better than 50%. Need a virus to worry about? The case fatality ratio for rabies approaches 100%–just about everyone who catches it dies– and there are two or three cases of human rabies in the US every year. The reason there are so few cases of rabies involves the second epidemiological value: the basic reproduction number, or R0 (pronounced “R-naught”), which measures the contagiousness of the disease. R0 can be thought of as the average number of additional people who will be infected by each new case of a disease during an outbreak. In an unimmunized population of children, measles spreads more rapidly than almost any other disease on Earth, with an R0 of about 18. One child will infect 18 others, and each of those will infect 18 more; at the end of just two viral generations , over 100,000 children will have been infected by that first case. The case fatality rate for measles is less than 0.2% worldwide and much less than that in developed countries, so while there are lots of cases, there are few deaths. If you really want to keep yourself up at night, don’t worry about Ebola going airborne, worry about measles going lethal. When R0 falls below 1, an outbreak sputters out. For human rabies R0 is nearly zero—no person with rabies infects another. That is why rabies, with its astronomical case fatality rate, causes so few deaths. For Ebola Zaire in the endemic areas, R0 is around 2. The first case infects two, and each of those infects two more, so that after two viral generations only 4 people are infected. This can be reduced to near zero with effective isolation procedures and personal protective gear. This holds for the Dallas case. Duncan (the “index case”) only infected two nurses (R0=2). When the nurses were placed in appropriate isolation, no further transmission occurred (R0=0). Something similar may be happening in the African epidemic. Time Magazine reports that in October the accumulated number of Ebola deaths worldwide was reported to be 4922, from a reported total of 13,703 cases, for an CFR of 36%. This is a hopeful sign. If these numbers hold up, it will suggest that the improved medical care in the field is having a measurably positive effect. (That is a big if. These are early, raw numbers from a part of the world whose social fabric has been rent by a succession of wars and a devastating epidemic. Still, if they hold…) Deadly as it is, Ebola does not spread easily in a population, and its spread can be effectively fought. 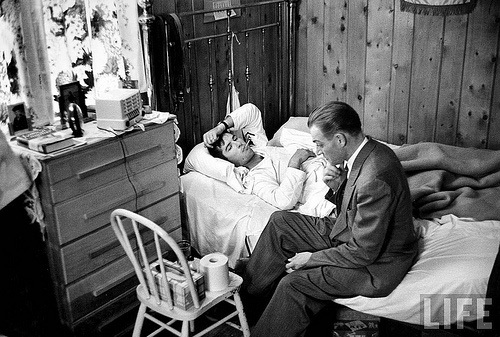 It is worth noting that for three days after his first Emergency Room visit Mr. Duncan lived at home with his family. There is little doubt that he was both symptomatic and contagious during this time, yet no one in his family got Ebola. Why was it only when he was admitted to the hospital that the disease spread? 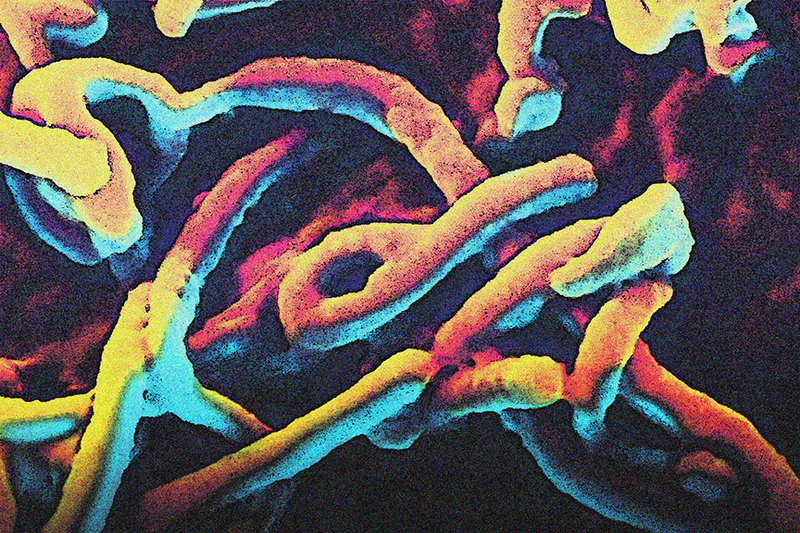 The answer lies in the biology of the Ebola virus. The most highly contagious viruses (high R0) are spread through the respiratory tract. This can happen in two ways. In a person with infected airways, tiny particles called aerosols are secreted from the linings of the deep airways and exhaled passively. They are microscopic and invisible, and they can drift for many yards, especially in an enclosed space. These structures are so small that they dry out almost instantly, like inkjet inks, so to transmit by this route a virus must be able to withstand desiccation. Because they are so small, they can be inhaled deep into the lungs, where they are easily absorbed to infect the same sort of membranes that created them. Infection is passed from lung to lung. Coughing and sneezing is not required, though it does enhance the process. The only effective prevention is good hygiene and a respirator with a Millipore filter; paper face masks offer little protection. 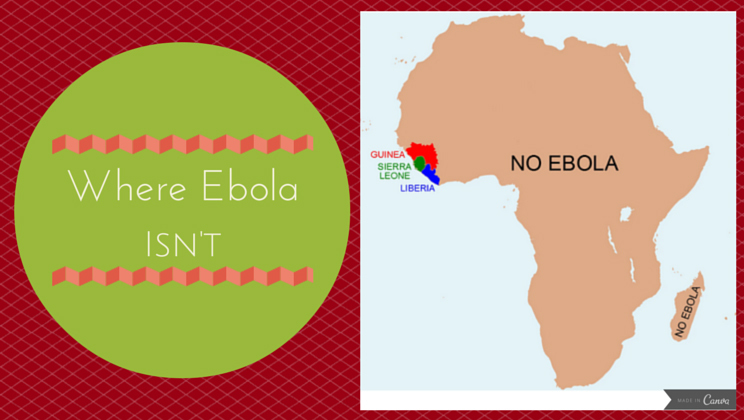 Measles is spread by this airborne route; Ebola is not. A related mode of spread is by airborne droplets. An infected respiratory lining increases its secretion of mucous in an effort to flush the virus away. The droplets that are expelled during a cough or a sneeze are much larger than aerosols and travel much less far, settling on surfaces like counter tops and doorknobs, from which they get onto hands and into food. They are ingested, passing the infection on. Careful hand washing and surface disinfection are effective preventive measures. Paper masks may provide some protection during close contact with infected people. 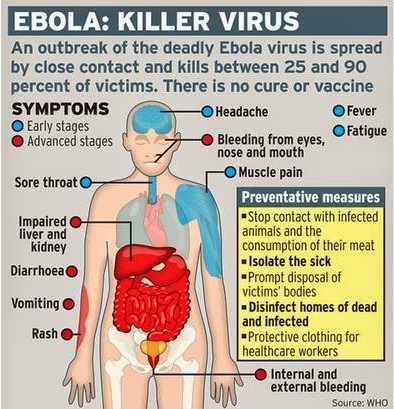 Influenza and the common cold spread this way, but not Ebola. When the media talk about Ebola “going airborne,” they seem to be talking about one or both of these mechanisms. Both require the involvement of the respiratory lining. Neither comes close to describing the biology of Ebola. To “go airborne” Ebola would have to develop resistance to dessication, the ability to infect the respiratory membranes, and a number of other traits it now lacks, and they would all have to occur simultaneously in the same viral strand, which would then have to survive to reproduce itself. A single gene mutation would not suffice, as it does in influenza virus to vary its lethality from year to year. There are significant genetic barriers to Ebola’s suddenly “going airborne.” Not that the change could never occur, but if it does it will be through an evolutionary process, not a mutation, anf it will take time. Evolution is subtle and powerful, but not quick. 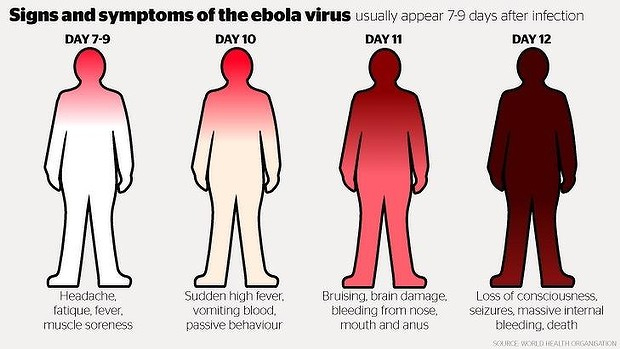 Despite its virulence, Ebola is a bit of a wimp among viruses. It must be constantly moist, dying quickly in aerosols and surviving only an hour or two in surface films. To infect, Ebola virus must he carried in a bit of protective fluid to a place from which it can insinuate itself into a circulating body fluid (blood or lymph) of a person who has never had Ebola and thus is not immune. Intact skin will not do–because it is waterproof the virus cannot penetrate it–but cuts, scrapes, and open sores are doorways to the moist interior for virus in an errant droplet fresh from an infected person. The wet membranes that line the nose, mouth, and eye sockets, even intact, are easy gateways for the virus even without defects. Once within the body the virus encounters wandering cells of the immune system, which pick it up and carry it throughout the body. While this is happening the virus is completely contained within the body in very low concentrations, and is not shed. This interval, the incubation period, can last from a few days to a few weeks, during which there are no symptoms and no risk of contagion. When it finds the organs it prefers—the liver, intestines, and the blood-forming bone marrow and spleen—the virus hijacks their genetic machinery to rapidly reproduce itself, destroying the cells in the process. After a brief prodrome of muscle aches, headache and low grade fever, the main symptoms strike suddenly and are extreme, reflecting the organs that are being destroyed. High fever occurs, as with any serious infection. Sore throat is common early because the tonsils and adenoids, organs of the immune system, are targets. Violent vomiting and copious diarrhea, often bloody, issue from the dying gut, accompanied by severe abdominal pain. The liver is no longer able to create the factors that facilitate blood clotting, so unchecked bleeding ensues. Muscle aches, reminiscent of influenza, are common, and the inflamed muscles leak proteins into the bloodstream, which in turn clog up the kidneys. No longer able to filter toxic metabolic wastes from the blood, the kidneys cease making urine altogether. It is worth noting that wheezing and cough are not on the list of symptoms. This is consistent with the observation that the lungs are not a direct target of the Ebola virus, taking aerosols and airborne droplets out of the virus’ means to spread. During this phase large volumes of fluids of various sorts are expelled forcefully from the body, all teeming with viruses enveloped in their little balls of protective mucus and broth. The extreme distress of the sufferer elicits feelings in others which cause them to gather close and care for him, exposing their own skin and membranes to the deadly fluids. This is a highly evolved reproductive strategy for a virus that kills quickly and so must spread reliably and fast, but it is hard to imagine a more efficient killing machine. Let’s look back at Thomas Eric Duncan. He flew from Liberia during the incubation period, when he was shedding no virus and posed no danger to fellow travelers. When he presented to the ER on 9/25 he was beginning to feel ill, and presumably to shed virus, but only in body fluids and not in aerosols or airborne droplets. He posed no danger to the people he was waiting among, though he might have put a housekeeper at risk if he used the bathroom. Health care workers who handled his lab samples or started his IV may have faced some risk, but the universal precautions practiced by hospitals in these circumstances offered sufficient protection for such small, controlled body fluid exposures. When he returned home he was presumably well enough to tend to his own personal hygiene, so family members were not exposed to his infected body fluids, except perhaps for the person who cleaned the bathrooms. Fortunately, in this comparatively low risk situation no one fell ill.
Thomas Eric Duncan contracted Ebola while heroically helping to transport his landlord’s stricken daughter to an Ebola treatment facility in Monrovia. They were turned away for lack of room, so he took her home, where she died. Four days later he flew to Dallas to visit family. 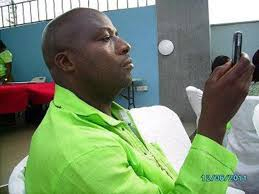 He fell ill and died there, the first to die of Ebola in the US. So the first small outbreak of Ebola in America unfolded precisely as the formulas of epidemiology and the biology of the virus predicted it would. The outbreak was eliminated within one viral generations. Next time we will do better, because of two important lessons were learned. First, whenever anyone presents with a fever in any acute care setting, we must learn of any foreign travel history or any other pertinent exposures, and be ever vigilant for the possibility of Ebola. Second, we must design a second generation of personal protective equipment and protocols, based on the experience obtained in Dallas. While isolation is an essential part of any Ebola management policy, it is also the most controversial. It brings into conflict two cherished American principles—individual freedoms and the right to due process clash with the public’s right to take swift and definitive action to protect itself when pestilence threatens. In the political arena, the precision of science quickly becomes a swamp of uncertainty, made worse by the mass media, unclear on the science but accustomed to reporting on politics, give far more time or space to the latter than the former. To quarantine someone because he might become contagious looks a little like imprisoning someone because he might rob a bank. We don’t have a legal right to lock people up for something that might, or might not, occur. Do civil rights trump public safety? Quarantine has been used here since 1663, when a fledgling New York City used a quarantine to help quell an outbreak of smallpox. Mary Mallon (“Typhoid Mary”) spent over two decades in forced isolation to prevent after infecting over fifty people at the turn of the twentieth century. Quarantines were used on several occasions after the terrorist attacks of 9/11/2011 when weaponized anthrax attacks were suspected. Currently US law Title 42 U.S.C. §§264 and 266 permits the Secretary of the Department of Health and Human Services the peacetime and wartime authority to control the movement of persons into and within the United States to prevent the spread of communicable disease. Only diseases specified in an executive order of the President can be quarantined. Under Executive Order 12452 (April 4, 2003), and its amendments, the list of quarantinable diseases includes “…the viral hemorrhagic fevers (Lassa, Marburg, Ebola, Crimean-Congo, South American, and others not yet isolated or named)”. The federal government clearly has the power to quarantine. State and local health authority powers vary according to state laws, but most recognize some power on the part of the state to limit the movement of people who may carry serious contagion. I fact, the powers of state health departments are often more sweeping in this regard than federal powers are. According to US Title 42, in the event of conflict of federal, state, local, and/or tribal health authorities in the use of legal quarantine power, federal law is supreme. So there is legal precedent and black letter law that supports the government’s use of quarantine, but who should be quarantined? Down this road lies the ethical quagmire. Surely it is not fair to lock up people who pose no risk to the public health. Asymptomatic travelers returning from an Ebola hot zone, who have had no contact with symptomatic Ebola patients or their corpses, carry virtually no risk; forcibly isolating them would be difficult to justify, though asking them to voluntarily monitor their body temperatures and report any fevers might be reasonable, if not reliable. Asymptomatic health care workers returning after giving care to symptomatic Ebola patients or burying Ebola dead within the last 21 days are at much higher risk, perhaps justifying some level quarantine. Returning healthcare workers with fever, sore throat, and GI symptoms? Most experts would put them in strict isolation right away until reliable testing for Ebola can be done. People returning from a hot zone with just a fever, runny nose and cough? Hmmm? What about a missionary with no symptoms, who is known to have survived a documented infection with the Zaire strain of Ebola in the past and assumed to be immune, who is now returning without symptoms from a six-week stint of caring for patients with the Sudan strain? Yikes! Too many variables! 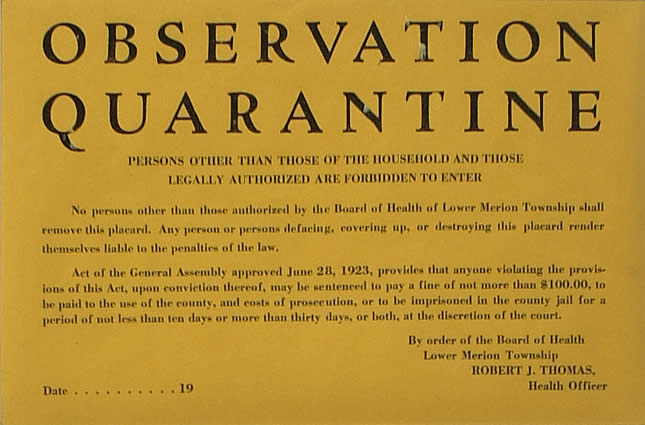 Even before considering the human factors: the possibility that someone facing the possibility of a three-week internment might lie about his travel history and the vast uncertainties of voluntary compliance, it is clear that there is not a one-size-fits-all solution to the seemingly simple question of who needs quarantine. American Ebola Quarantine Facility? Lets hope not. 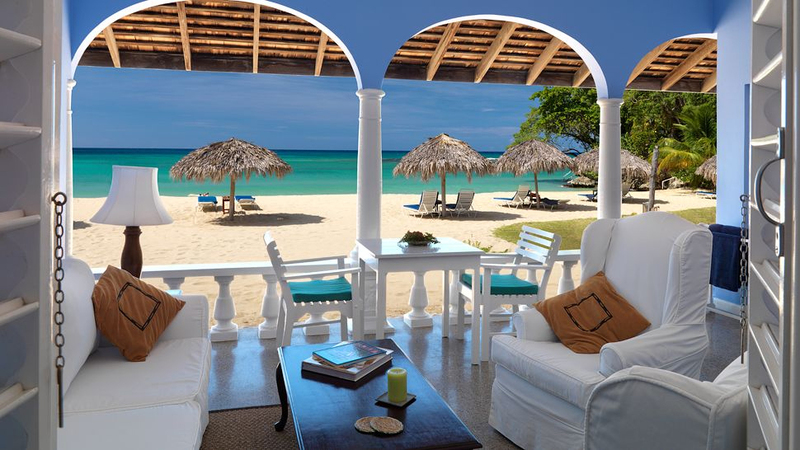 I have heard it suggested that the US buy a Caribbean resort and build a prison fence around it. Every traveler to America from an Ebola affected area would be diverted there for 21 days of enforced fun in the sun, an all-expenses-paid mandatory vacation in a tropical paradise, while their incubation clock runs down. One problem with that is that incarceration in Club Med is still incarceration. The ethics of the situation aren’t changed if the prisoners cannot leave. A bigger problem ethically is that the many millions of dollars it would take to keep such a frivolous operation going could be better spent in West Africa, saving lives and putting an end to the epidemic that threatens us in the first place. Which brings me to my final, and most important, point. All the national treasure and political capital spent in on controlling Ebola in America is mere diversion from the main task at hand. Any effective strategy to protect us from this threat at home will have to involve extinguishing the outbreak in Africa. So, what, do you soak in it? We have all watched the TV news and seen homeowners in California stand on their roofs spraying the shingles from a garden hose while wildfire sweeps towards them through the forest. Safe and comfortable in our living rooms, we can see that their desperation has affected their thinking. It is clear to us that their homes will not be safe until the forest fire has been put out. So it is with Ebola in this age of rapid intercontinental travel. While the infection rages in Africa, America is threatened, however slightly. Now it is we who are panicking, and our own thinking is distorted. 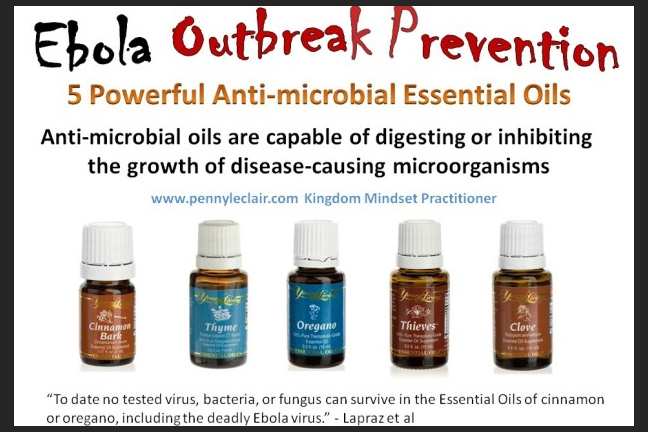 We are being sold Ebola protection stuff that 1) doesn’t work, and 2) we’ll never need anyway; American business will always find a way to squeeze a buck from our anxieties. Political posturing and tax dollars spent (or conspicuously not spent) on American Ebola may influence elections here, but do little to end the scourge that is the real threat to our homeland. In America we have a shameful tradition of venerating our soldiers as they march off to protect our freedoms, only to ignore or even ostracize them when they return. Even worse is our treatment of of volunteers who go to Africa and risk themselves to protect our very lives from an invisible but deadly foe. We ignore them as they march off to battle for us, and incarcerate them on their return. Nor is it the American Way to spend US tax dollars on pitiful Third World countries with no hope of diplomatic advantage or return on investment—so the job of eradicating Ebola is left to churches and not-for-profit charities. Thus the vital work of eliminating Ebola is fragmented and under-funded, making it much less effective than it must be to succeed. To fight wars we build coalitions to battle under a single, coordinated command. We need to do the same to fight Ebola, and then we need to commit the necessary manpower, equipment and supplies to finish the job. 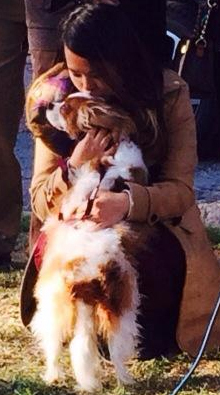 Happy Endings: Ebola survivor Nina Pham is reunited with her friend Bentley after both were released from separate quarantines. “Stopping Ebola is a priority for the United States,” he said. “We will continue to lead, and do our part. But this must also be a priority for the world. The President’s eloquence has been lost, as it so often is, in the babble of political rancor that surrounds him. But he is right. It is well past the time for us to get our priorities straight. We must recognize that it is a vital interest of America to eliminate Ebola in Africa, and the USA is among the few agencies on the planet with the technology, wealth, and international prestige to manage it. All we need now is the will. An earlier president, Ronald Reagan, remarked that nothing would unite the peoples of the world faster than an invasion by aliens from outer space. In a sense, that invasion has begun. Let’s get our act together, and end it. So I can go back to blogging about art. Is Medicine Art or Science? 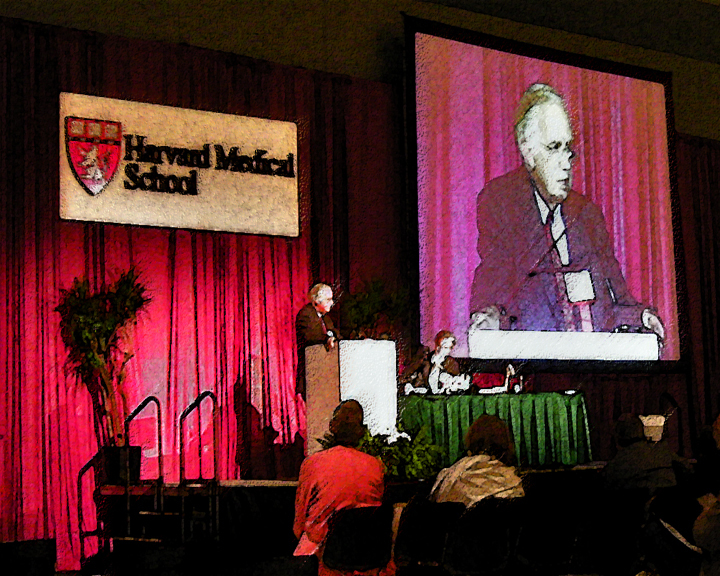 Pri-Med 2003: An annual medical conference and trade show in Boston, co-sponsored by Big PhaRMA and the Harvard Medical School. Many decades ago, on a planet far away, I attended medical school. My professors were learned and serious men. They frequently debated, over stale cafeteria coffee in styrofoam cups, a question which at the time I thought was rather silly. I now realize it represented a struggle for the life or death of the kind of medicine I came to love and try to practice. I fear the wrong side is winning. The question: is medicine a science or an art? What exactly does this question mean? There is a great deal more subtlety here than first appears. To start, let’s look at the dictionary definitions of the words art and science. Art (noun): something that is created with imagination and skill and that is beautiful or that expresses important ideas or feelings, or the methods and skills used for producing works of art. Science (noun): the systematic study of the nature and behavior of the material and physical universe, based on observation, experiment, and measurement, and the formulation of laws to describe these facts in general terms. So art is rooted in interior human qualities: imagination, skill, and aesthetics. The doctor I picture is an avuncular man, perhaps a little overweight, on the threshold of old age, in a slightly rumpled three-piece suit. His experience ranges back to ancient lore, but he keeps up-to-date through the medical journals and continuing education symposia at far-flung universities, to which he likes to travel with his wife. He knows everybody in your family, in your whole town even, and everybody respects and trusts him. His diagnostic skills are largely instinctive but unerring, and his therapeutic skills are encyclopedic, including some effective traditional techniques that today’s young bucks were never taught. You may recognize him from several Norman Rockwell paintings in which he has appeared. Of course he makes house calls. He practices the art of medicine. Science, on the other hand, arises from the universe at large, working back from specific observations to glean the general principles that determine how things work. I see a man in early middle age, clean-shaven and trim, who moves crisply in a long white lab coat, a stethoscope hanging from his neck. He commutes to his office in your town; he doesn’t know anyone there personally, and nobody really knows him, though he is respected for his training and skills. His diagnostic acumen is fact-based, making extensive use of lab and imaging studies to reinforce his clinical impressions. His therapies have been verified in double-blind studies and are regularly updated to be sure they reflect the latest best practices. You’ve seen him in his pharmaceutical ads on TV. There is no point in his making house calls, since his kind of medicine is dependent on the clinical support services that are available at his office or the hospital, but not at your house. His medicine is a science. Wait a minute. Those definitions don’t really tell the whole story. Sometimes the line between art and science is more uncertain. Michel Eugène Chevreul (1786 – 1889) was a French chemist whose work with textiles and dyes led him to think scientifically about color and its perception. 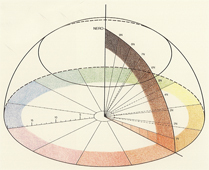 He published The Laws of Contrast of Colors, and devised the first color wheel. His ideas were taken up by the renowned neoimpressionist Georges Seurat (1859-1891), who expanded on them in an attempt to produce a comprehensive science of painting, which he called chromoluminarism. 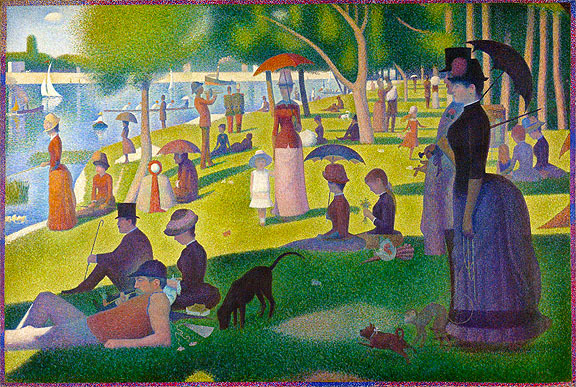 Seurat used these principles to paint in a style now known as pointillism, which includes his well-known mural Un dimanche après-midi à l’Île de la Grande Jatte. Is this painting the product of art, or science? 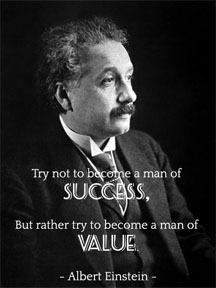 Then there is Albert Einstein (1875-1955), probably the best known scientist of his day, who famously did most of his experiments entirely in his mind, aided only by blackboard or pencil and paper. These grand mental expeditions, which he called gedankenexperimenten (thought experiments), involved no new observations, measurements, or physical experiments by Einstein himself. Such intense interior work produced beautiful ideas “created with imagination and skill” and “that [express] important ideas.” These are supposed to be the hallmarks of art. Einstein’s ideas became the general theory of relativity, the reality of which has been verified many times over by the real-world experiments of others. Is relativity the product of science, or art? Years ago, when I was a country doc still wet behind the ears, I cared for an aged widow who lived alone at the end of an narrow dirt road. Her husband had died a few years before, and her only son had not returned from Viet Nam. 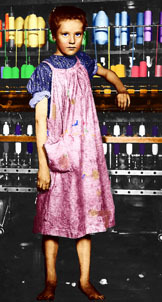 She was very slowly dying of pulmonary fibrosis, a slow but relentless lung disease that was the result a childhood spent in the textile mills. Her mind was clear, and she had learned how to pace herself. She still managed to prepare her own meals and keep her little cottage tidy. I visited her at home once a week after I’d finished my work in the office. She told me how her symptoms were going while I listened to her heart and lungs. That was the routine that allowed the housecall to proceed without embarrassment to to either of us, though strictly speaking it was not medically necessary; nothing ever changed much. Then the real purpose of the visit began. She brought iced tea from her refrigerator and we sat in two antimacassared wing chairs in her little sitting room to watch The Price is Right or play Parcheesi, which she had played with her son when he was a boy. We watched the birds at the feeder outside the picture window; she knew the names of every one and could mimic their calls with uncanny fidelity. I spent an hour or so with her each week. In the summer, in her faded housecoat and frayed felt slippers, she would follow me out to my car and wave at me as I drove away, bunching her clothes up in front of her chest with her other hand while a few errant grey hairs blew backwards in the wind. There is no billing code for what I did; I never got a dime for it from Medicare. I think it extended her life a bit, though, and I know she was happier for it. That is the art of medicine. 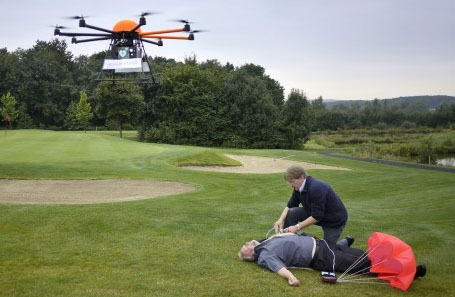 High Tech: An aerial drone has dropped a defibrillator to help a man stricken on the golf course. One autumn day she followed me to my car, but before I could get into it she looked suddenly quizzical and made a brief little sound, not unlike the yelp a kitten might make, more startled than pained, when comfortable play gives rise to a painful nip. Then she collapsed, pulseless and unresponsive, onto her threadbare lawn. I was well trained and equipped for this situation. I took the defibrillator from my trunk, ran a strip (v. fib) and defibrillated. She responded to a single shock, and was soon alert again. I slipped an IV into veins like tissue paper and hung the bag of fluid from the mailbox. I gave her a dose of a drug to support her now normal rhythm, and told her to lie still while I went into the house to call the Rescue Squad. The science of medicine is brisk, efficient, and clear cut, if a little cold. What drives it is success or failure, which can be measured and judged. When metrics are applied this outcome would count as positive, although the widow might not agree. I remember well what she said as I turned to go: “What the HELL did you do that for?” she yelled after me. It is the only time I ever heard her curse. I went inside and made the call—the ambulance was rolling. When I got back to her she was lying still. Her eyes were open, but they did not follow me. A few dry leaves had blown up onto the edges of her housecoat where it had spread out carelessly on the struggling grass, in front of the little cottage on the edge of the woods where she had come as a bride; where she had raised a son who, right out of high school, had given his life for his country; where she had held the hand of the husband who had shared her sorrow as he too slipped away from her after fifty years together, for better or for worse. 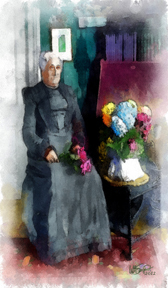 A few minutes ago she had died there peacefully, only to be wrenched back into a world she was weary of by a doctor who was not yet born on her wedding day, and who was only now just beginning to understand the wisdom his patients brought to his practice, which would form the foundation on which he would build his ever changing understanding of the art of medicine. While I was in her kitchen making the call, she had died again. Her final act had been to pull the IV line from her arm; its life-sustaining fluid was now making a dark, slowly growing stain as it seeped into the parched October soil on which she lay. I made no further effort to revive her. 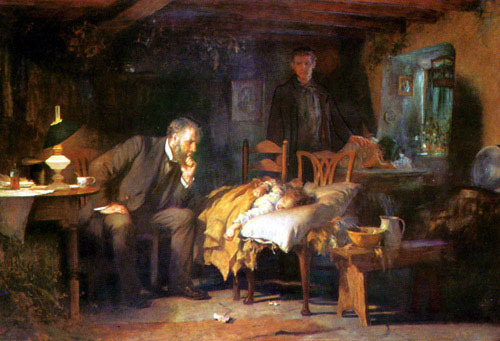 The art of medicine is rich and warm or cold as ice, and always rife with ambiguities. It is filled with triumph and with pain, which are unsuitable subjects for measurement and analysis. 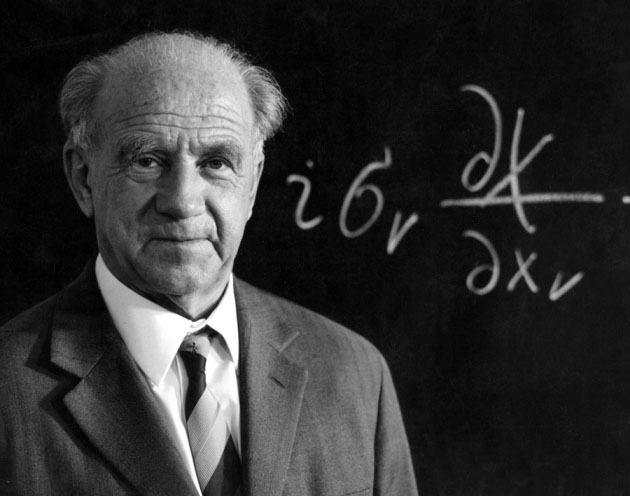 A contemporary of Einstein’s, Werner Karl Heisenberg (1901 – 1976), noticed, while observing subatomic particles, that if their velocities were measured precisely then their positions appeared indistinct, but if their positions were closely measured, their velocities became fuzzy. Heisenberg posited that this was not because of a shortcoming of the observational technique, but a fundamental property of the universe itself. Heisenberg offered no direct proof for this interpretation of his principle, and expressed the idea only informally and intuitively, though with mathematical precision. Science, or art? Whichever it is, his Uncertainty Principle it is now a key stone in the foundation of modern quantum mechanics. For lots of us, technology serves as a proxy for science. Science is an active pursuit, requiring the expenditure of considerable mental effort–something many are reluctant to do. Technology, on the other hand, can be passively received, as Stephen Jobs so ably demonstrated. 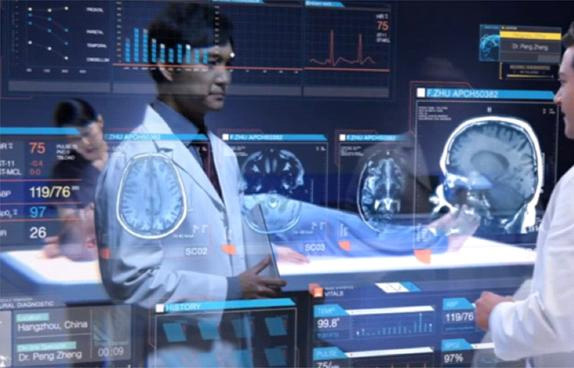 Today we want the latest technology front and center in our healthcare, like nuclear magnetic resonance imaging and positron emission tomography. (Positrons? Really? Isn’t that antimatter? The stuff that fuels the Starship Enterprise? Cool! I want that.) We want our doctors to use “evidence-based” diagnostic and therapeutic tools and techniques. I believe medicine has always striven to do this, but now “evidence” is narrowly defined (by people far smarter than we are) as statistical data derived from large-scale double-blinded crossover studies that have been subjected to peer review. (Except, of course, for the proprietary bits that the pharmaceutical companies sponsoring the research must withhold as industrial secrets to protect their market positions.) A doctor’s personal experience, accumulated over a lifetime of practice, observation and personal growth, no longer counts for much. Such twaddle, unseemly for the distinguished scientists we aspire to become, is left to artists (who, without our fresh enlightenment, don’t know any better). We patients (reborn now as “consumers”) check the internet to see how our doctors (excuse me, “providers”) measure up against dispassionate “performance-based” scientific metrics applied by our insurance companies, or the looser, more passionate metrics from those “Rate Your Doctor” websites or Angie’s List. 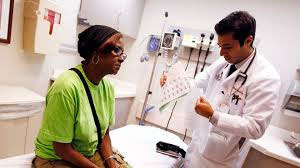 While observing our doctors in such an intensely measured, highly analytical, fiercely statistical manner, we look over our shoulders wondering where the old guy with the reassuring bedside manner and old time smarts has gone. Even as I look elsewhere for my art, I feel behind me the presence of the zombie that is all that remains of that other art I fell in love with in my youth, now lumbering soullessly toward a gray uniform mediocrity foretold by Delphic statisticians in cubicles across this nation, a nation held captive by the data miners and big-number technology that are consuming so much we once held dear, all in the name of political power and commercial gain.